Review detailed images of our fake IDs. Fake ids are our business, not a side venture. We are a dedicated team of designers with a passion for perfection. 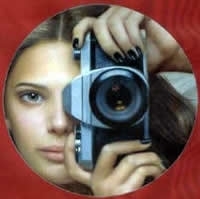 Please review our images closely and see for yourself that our fake ids are flawless. This month we are featuring our Texas fake id. It will pass in-state inspection, as do all of our fakes! Click the images to see the larger version for a close up look. Our Texas fake id, printed on teslin, will arrive to you encoded to correctly scan with a magnetic stripe...1D barcode and 2D barcode. The Texas fake id and scannable fake drivers license, fake drivers license number is 8 digits, unspaced, and uncoded. Unless you have a specific number to use, the number you supply is just a random 8 digits. 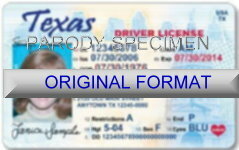 A Texas fake id will be valid for 6 years, and expire on the DOB you put on the order form. Texas is Real ID Compliant, but has yet to indicate this by printing the gold star on the front. When this changes we will immediately update our template. Flawless fake id front and back. Every security detail is perfectly replicated, from microprint to UV ghost image on our Texas fake. Click the images to see the larger version for a close up look. The tactile raised print, specifically for Texas, is the date of birth over the main left image. We use the latest printers, capable of tactile printing, according to the fake id template specifications. This is a very simple security measure used only to prevent altering of a current license holder's birth date. Our printers are the "latest and greatest", as the saying goes. Microprint and perforated printing, is accurate based on the fake id template requirements. We might sound like a broken record, but we want every customer to know our commitment to perfection. In this business, just ok or adequate will not do, we want to be the best and make sure you KNOW. We are not youths making a few sub par fakes out of our bedroom with a flashy website, we are the best with years of experience. The Texas state seal photo on the right, and the three stars in the data area in the optical variable ink changes color as the license is tilted. You can see we replicate with 100% accuracy! You can have complete confidence using our fake ids as if it was a real id. NO crossing your fingers because of missing or low quality replication. Nothing leaves our facility that is not perfected! This is an image of the back side of our Texas fake id under UV light. The ghost image is clearly visible along with the date of birth. It is an absolutely perfect replica of a real Texas license. Rest assured, you will not be turned down at the entrance of any night club, in-state or out. To ensure success, always use your real name on your fake so you can supply a second piece of ID with your name on it, such as a credit card. That is a commonly asked question to ensure you are not using another person's ID.